The 50th anniversary of the publication of the novel "To Kill a Mockingbird" was commemorated at Samford University last week with a series of special events. "Song of the Mockingbird," a commissioned documentary about the Pulitzer Prize-winning novel, was featured in a special student showing on Thursday and a public showing on Saturday evening. The documentary, produced by artist Nicolosi, featured interviews with residents of Monroeville, Ala., home to author Harper Lee, and Alabama historians J. Wayne Flynt and Nancy Anderson. Nicolosi, Anderson and Flynt led group discussions and answered questions about the novel and author following both showings. 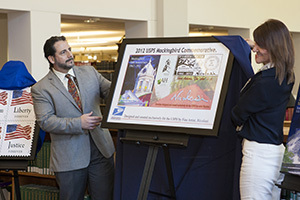 The unveiling was cosponsored by Samford, the USPS and the Alabama Humanities Foundation. Nicolosi recalled how he was commissioned by AHF to do a special portrait for the 50th anniversary celebration. During that time, he was introduced to Harper Lee and began the friendship from which the documentary ultimately emerged. "The artwork you see today is an outgrowth of that relationship," he told the gathered audience in Samford's Harwell G. Davis Library. Armand DeKeyser, AHF executive director, noted the significant of the occasion. "It's not often that we get to recognize what a great work 'To Kill a Mockingbird' is," he said. In addition to the USPS unveiling, the day included the unveiling of a replica of the Monroe County courthouse cupola. The building in Lee's hometown often is presumed to be the prototype for the fictional courthouse described in the novel. The replica was commissioned by Birmingham residents and arts benefactors Dr. and Mrs. Chandler Smith. The Smiths support both Samford and AHF initiatives. The replica was produced by Birmingham artist Max Garcia, who assisted with the unveiling. Proceeds from the Saturday evening documentary showing benefitted Samford's University Fellows Excellence Fund, which supports students enrolled in the university's undergraduate honors program.